This entry was posted in Blog, shrubs and tagged shrubs by Nora Harlow. Bookmark the permalink. 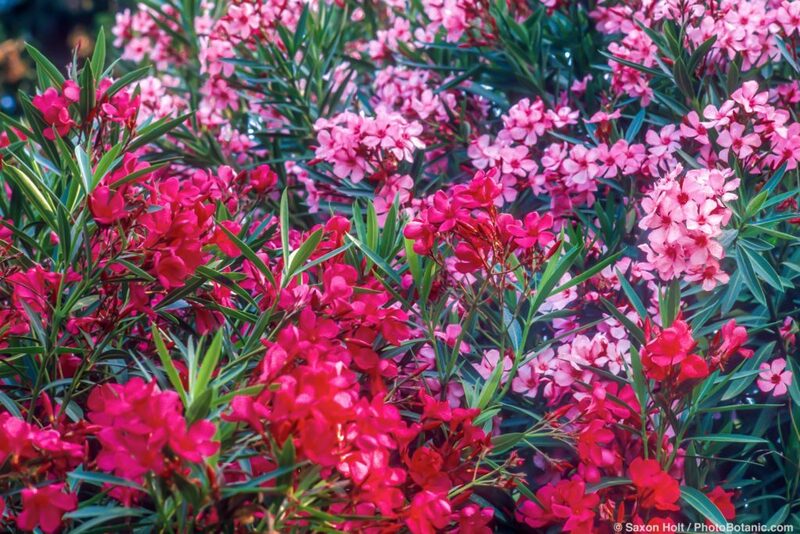 They are no longer suitable in southern California where the slow march of progress has brought us an oleander leaf scorch disease that is ultimately fatal. I don’t mind one bit. As you point out, the plant is tediously ubiquitous in tract landscaping, along freeways, and (prior to widespread disease) big box home improvement centers. Thanks for this update Brent. Ubiquitous, yes, tedious, maybe, but where oleanders are not affected by various bacterial and viral diseases, they really do have some very fine qualities. Here in California we are jaded, I think, from decades of overexposure. I have to admit that I also put the flowers in vases, where, though rather floppy, they are long-lasting and gorgeous! As a colorful barrier against deer there is no better. In the right place ( background with plenty of space) I have not so much see leaf scorch but sooty mold left over after an aphid infestation that just looks horrible. I have started putting them in some gardens I design where appropriate especially in areas where deer grazing is a problem – it is one of the few plants that I have seen deter deer. Carol – The are indeed deer proof as they are poisonous. Be careful of putting then anywhere that livestock might graze. I should have mentioned their absolute protection against deer, for that is why I originally planted them! Deer simply do not touch oleander. Overused and poorly-used, yes. But worthy of certain applications, to be sure. Here, no leaf scorch so far, and people treat like perennials they pack in too close and severely cut back each year…and they like that, too. David, you are right! Many of the problems with oleanders have to do with poorly thought out applications. This plant is wonderful where appropriately used, though I do understand why so many people these days avoid it, perhaps because of its overuse in the past in our part of the world. I’m expecting oleanders to come back in fashion some day (as so many good but overused plants have).